Around this time last year, dancers were feeding those in need by taking ballroom, burlesque, Zumba and jazz dance classes. In four hours, nearly 100 dancers donated $1,440, which translates to about 4,000 meals. Melena Rounis is bringing her high-stepping fundraiser to Las Vegas for the third year running. Step Up and Dance will be at the The Rock Center for Dance from 12:45 p.m. until 4 p.m. on Nov. 19. Six outstanding dancers are donating half-hour master classes (master locker Scoo B Doo of the original Soul Train gang included), and the money raised will be donated to Three Square food bank. A minimum $10 donation buys a pass to take one, all or a combination of the classes. For extra-good Samaritans, $20 nets a T-shirt as well. You don’t need to be a dancer to participate and all ages are welcome. For more information about the event, check out my blog post from last year. Or, better yet, grab your dancin’ shoes, head over to the Rock on Nov. 19 and step up to help out before the holidays. See you there! Starbucks has its holiday cups. For some dancers, rehearsals for holiday shows have started — tunes about mistletoe and snow (what is that again?) can be heard in studios all over the city. Another holiday tradition took place on Nov. 27 at the Rock Center for Dance: Melena Rounis, with help from Katy Tate, organized the second Step Up and Dance event, a fundraiser that takes donations for Three Square food bank in Las Vegas. In the space of four hours, 88 dancers signed up and $1,440 was donated, which is the equivalent of more than 4,000 meals. All of the proceeds from the event will be donated to Three Square. The workshop brought together eight different performers, many with credits from shows on the Strip and elsewhere, to teach a post-Thanksgiving dance-fest that raised money for families in need. The four-hour block of time was divided into eight half-hour-long sessions. Agnes Roux, Katy Tate, Saleemah Knight, Fred Odgaard, Brent Borbon, Leah Moyer, Sheila Joy and Rounis herself each taught a class in styles including zumba, hip hop, jazz, ballroom, burlesque, contemporary, lyrical and jazz funk. Participants donated $10 at the door and were welcome to take as much or as little class as they wanted and all ages were welcome. “It’s so much positivity in one day that it’s crazy,” Rounis said. 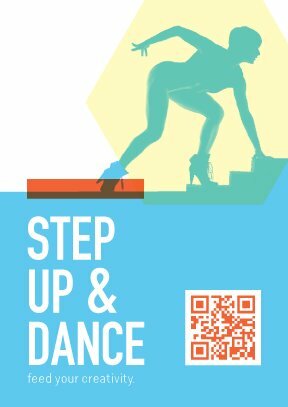 This was the second Step Up ad Dance event and Rounis said that the diversity of the faculty has been expanded. Last year’s teachers all hailed from “The Beatles LOVE,” the show in which Rounis is currently cast. “We hoped to attract a more eclectic crowd [this year],” Rounis said, referring both to the faculty and the participants. For many of the guest teachers, professionalism and training for future careers took center stage. Emotional cortexes weren’t the only part of the dancers that received a workout. Fred Odgaard, powerfully built and energetic, led dancers in a warm-up that he said he and other fellow dancers call “cardio Barbie” (see photo, right). The exercise was a series of jumping jacks and the like designed to elevate the heartrate and get dancers’ blood pumping. 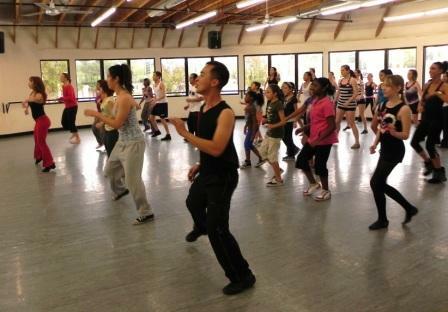 Roux’s spicy zumba kicked off the workshop, providing a Latin-themed warm-up for the rest of the day. Tate’s unique lyrical followed, complete with pleasantly literal choreography and percussive syncopations. Borbon and Joy held down the high-heeled contingent with ballroom and burlesque, respectively. Borbon’s light-footed and light-hearted banter displayed partnering at its best and Joy dimmed the lights to illustrate a sexier side of Vegas dance. The day culminated in Rounis’ hip hop/party dance choreography, complete with RoboCop moves and James Brown slides. The crowd of dancers, many of whom had stayed through the entire workshop, gradually dispersed. Rounis, her small frame eclipsed by an oversized bag stuffed with dance gear, dashed off to The Mirage and the two “LOVE” shows that awaited. Interested in seeing footage of some of the choreography? Check out my post here for a link. If you can’t possibly wait another second for photos and a post about Melena Rounis’ Step Up and Dance fundraiser on Nov. 27, fear not: footage of the event is available in high-definition glory here. Remember to keep checking back here for photos and interviews! Hang tight with the video in the meantime.